If you are a Bronie than nothing is more sacred to you than your pony costume and your first edition Rainbow Dash. Your pony grazes with dignity in the imaginary pastures where Applejack, Pinkie Pie and Princess Celestia adorn your shelves. But Miami is known for bad storms, and all too often a local water damage company must step in and perform water extractions while desperately fighting time to restore prized items that all the local Bronies would foam at the mouth over. Although Rainbow Dash has the power to control weather at the Cloudsdale Weather Factory while dreaming to join the Equestrian Arial Flight Team known as the Wonder Bolts, Miami will still continue to shake from hurricanes, bad storms and hard rain. 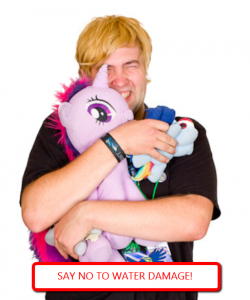 If your room and ponies get drenched you will need emergency water damage restoration services without delay. But in the meantime, here are some tips from water damage Miami experts for protecting your ponies from the threat of a household flood! All too often, according to water damage Miami pros, rain can blow into homes through cracks in windows and under doors. This may not seem like a big threat but all it takes is a single drop of moisture to fly onto Princess Luna’s mane and a mold problem could ignite. Just ask any mold removal company and they will tell you that mold spores populate on organic and semi-organic materials, including pony manes. If mold spores grow on your Sweetie Belle, she will become more rancid than sweet! Therefore by inspecting your cracks you can help minimize pony damage and prance off to the next convention with perfect pony specimens in tote! The water damage Miami techs warn that if your home has a lower level and your ponies reside in an area where rain water and pipe bursts have a greater potential for pooling, you will need to install sump pumps. An automated sump pump will automatically begin water extractions with a sensor; even if you are gone and attending the Brony Church of Equestria. We all know that Mane-iac means to harm the ponies, and so to does water damage in all its villainous wrath. If you want your ponies to attend the Grand Galloping Gala with Spitfire in all her rainbow glory, than you had best have a sump pump near your ponies to fight off the evils of H2o. Inspect your Roof or Suffer the Hoof! Rain leaks are common in water damage Miami scenarios, and if your roof is in bad shape water can leak through and dampen your ponies in which their hooves would never go “clip-clop” with glee again. If you notice any uneven areas or bulging in your roof, call a professional to come and do a thorough inspection. If you hope to prance with joy in Bronyland and partake in the company of ponies, you will need your little friends safe and dry. If your roof has issues water can seep down and cause a leak in your ceiling and ultimately leave your ponies with nothing but melted sugar cubes and rotten apples. Furthermore, you will get a swift hoof-kick to the face for allowing a roof leak to drench Twilight Sparkle. A wet, ugly pony is a phony pony! By following the tips from the water damage Miami saviors of watery pony woes, you can keep your little hooved friends safe and ready to be the envy of every boy at the next convention!